It seems that the world's investors disagree with Apple CEO, Tim Cook's statement that "the iPhone is the most loved smartphone in the world with the highest customer satisfaction in the industry," after Apple (NASDAQ: AAPL) stock fell following the Apple Live event on Tuesday. AAPL rose over three points during the iPhone 6 and iPhone 6 Plus announcements, reaching its peak when Apple's new mobile payments platform, Apple Pay, was released. Then the fall came. After Tim Cook's Apple Watch reveal, the stock plummeted from 103.08 to 96.14, only to end out the day at 97.99 (1.12 below the day's opening of 99.11). To give these numbers some context, the drop was roughly $5 (£3.10) and with six billion Apple shares that drop equates to roughly $30 billion (£19 billion). 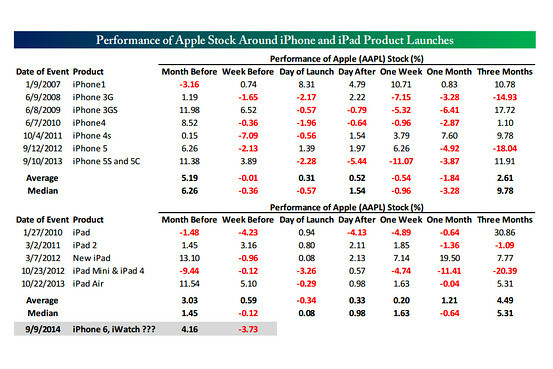 However according to the Bespoke Investment Group AAPL typically rises leading up to a new product launch, drops in the next month, and three months later shows healthy growth. Bespoke co-founder Paul Hickey writes, "more often than not, the stock has rallied in the month leading up to the event and declined in the one week and one month after the newest iteration was unveiled." Apple appear to have answered Andy Hargreaves, analyst of Pacific Crest Securities, concerns that Apple would limit its growth "unless Apple launches new products that can generate billions of dollars of incremental operating profit." Apple introduced two new revenue streams at their conference with Apple Pay, which Apple will collect a fee from banks after every transaction, and an app store for the Apple Watch.